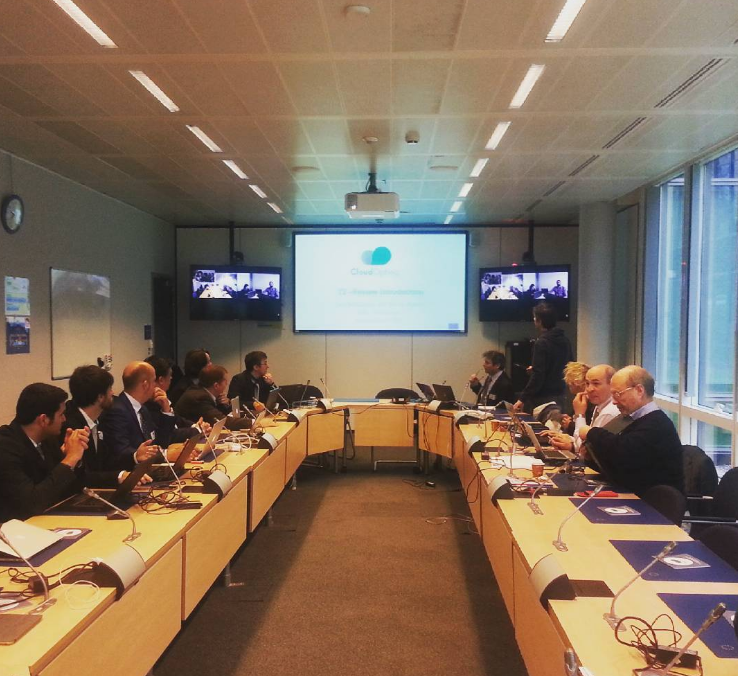 After a busy and productive year Electric Corby returned to Brussels with the CloudOpting project partners from across Europe for what was the second annual review of the project at the European Commission. CloudOpting is developing an ‘App Store’ for public services, allowing governments to download software and applications much like a user downloads applications to their smartphone. This ‘App Store’ will bring financial savings across Europe and the UK through reduced ICT infrastructure and administration costs, allowing local governments to put funding into critical services, such as health, education and safety. The reviewers, comprising an expert panel of Europe’s best and brightest, noted the projects potential to deliver real and lasting change across Europe, putting Electric Corby, and Corby itself, at the heart of ICT innovation and the digital revolution in this €6.5 million project. This continued success has attracted over €4m (£3m) in European funding to Corby through a series of innovative and pioneering research projects. Electric Corby CIC set out to establish Corby as a leading community scale centre for new sustainable ways of living, working and traveling. The EU grants are making this a reality. Energy Dashboard – Provides instant analysis on consumer energy, enabling users to lower their bills, and protect the environment. Business Portal – A portal which can contain all the SME initiatives and sources of funding available to the area supporting local businesses to network, collaborate and grow. CKAN – A web portal which improves the accessibility of local data and information, rendering new insight into local and public activities.